Information leads to dumping. That’s what happened to some blogging caregivers, according to Dawn. Getting such bonuses because we share info online is a nightmare we worry a lot about. 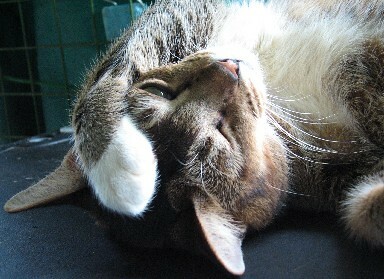 We want to raise awareness among people about the cat’s situation here in Singapore through blogging. But at the same time, we do not want to have to clean up after irresponsible people who just want to fob off their conscience on others. As it is, we are already familiar acquaintances with dumping even before we started blogging. Photos are carefully edited, and vids filmed discreetly to minimise identifiable features of the clannies’ abodes. That is part of the reason why there are much less updates on the clannies than we would like to do. Dumpers may well think to call the bluff on us and question our Scrooginess – since we’re already doing it, why begrudge extending the soup kitchen service to more kitties? After all, dumpers will provide the kitty transfer, at no cost to us, and dump so covertly that we would only see their handiwork, the transferred kitty, bewildered and stressed… if the resident cats had not yet run them off, or in their confusion, tried to cross roads and became roadkills. Here’s a bit of news about such situations: dumpers, the blood is on your hands. Here’s another: not that we don’t want to help, but we also have our limits. Plus since you, the kind-hearted dumper don’t want to take on the responsibility, what makes you think we want it? You dump, and that’s the end of the story for you, but for us, it’s just the beginning of having to shoulder a responsibility that you meddled with and then abandon. All the “kind” people who dump seem to think it perfectly conscioncible to leech off and exploit the species of softies called cat caregivers. What a great example of sharing woe. How about some passing out some weal and decency too, dumpers? Why not try a concept that may be novel: don’t dump, and if you really think you MUST, then be responsible, talk to the caregiver and shoulder your inductees’ maintenance costs. But that’s too much to ask for. Just as good karma feeders have to be fished out of their feel-good wading pool, dumpers need to be rubbed in the nose with this fact: being kind isn’t just about grabbing the easiest, most convenient solution. Why? Because dumpers are abusing the concept to disguise their own lazy conscience and to get that “high” of having notched a good deed on their misshapen totem pole of karmic goodness. The best reward for dumpers is for them to get a taste of their own medicine, sans candy-shell.